Diego Costa was on target in a 2-0 win as Barclays Premier League leaders Chelsea proved a barrier too far for West Ham. The Hammers, who began the day in fourth place, have been transformed since being criticised by Jose Mourinho for playing "football from the 19th century" last season and joked on Twitter they had arrived at Stamford Bridge by horse and cart. Sam Allardyce believes that goalless draw was the turning point for his side to go from relegation candidates to European hopefuls after they achieved their highest Christmas position in nearly 30 years. The Hammers boss had spoken of breaking down barriers, but compromised his enterprising tactics for a more pragmatic approach in a bid to frustrate Chelsea once again. The Blues, though, have a greater armoury than last term and threatened repeatedly before John Terry's tap in after 31 minutes broke the deadlock. And Costa's 13th goal of the season sealed victory and a ninth win from nine home games this term. The win might have been more convincing but for fine saves by Adrian to deny Gary Cahill, Eden Hazard and Nemanja Matic. There was one moment of alarm for the Blues as West Ham substitute Morgan Amalfitano hit the post three minutes from time. Chelsea go to Southampton on Sunday looking to enter 2015 on top of the table. The Hammers, who lost for the second time in 12 games, host Arsenal in another test of their European ambitions. Allardyce, unfazed by the pre-match compliments from Mourinho over his new approach, tinkered with the diamond formation which has served him well this season, deploying a 4-2-3-1 set-up. The hope was to be resilient and test the Blues on the counter attack, but in reality Andy Carroll became an increasingly isolated figure as the match wore on. The Blues looked for more guile following Monday's 2-0 win at Stoke, with Oscar replacing John Obi Mikel. The Brazil playmaker should have scored inside five minutes. Carl Jenkinson watched Willian's cross go by him and fall to Oscar, who ballooned his shot over from eight yards out. Cahill headed just over and then fired straight at Adrian from point-blank range. Hazard shared return passes with Willian and Oscar but the ball did not break for him in the box as Chelsea went close again. The Blues took the lead from the resulting corner, taken by Cesc Fabregas. Diego Costa headed the ball down for Terry to net from two yards. Matic curled narrowly wide and Costa's deflected strike went wide before the striker shot over as Chelsea sought a second. West Ham had to be more forward-thinking in the second half, but it was Chelsea who went close to scoring again when Hazard stung the palms of Adrian. Willian curled a free-kick just over after Hazard was felled by Winston Reid and Allardyce had seen enough, readying Diafra Sakho and Alex Song for action. 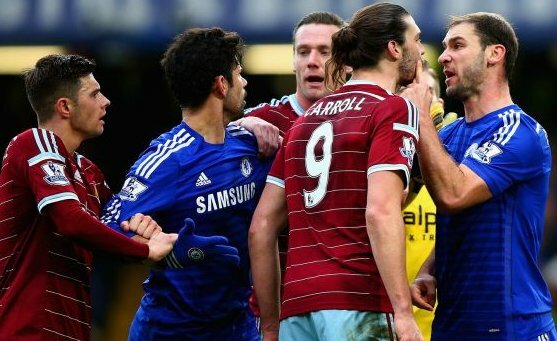 Carroll and Mark Noble made way, but no sooner had Sakho and Song entered the fray then Chelsea went 2-0 up. Cheikhou Kouyate lost out to Matic in midfield and Hazard picked up the ball, feeding Costa. The striker ran at West Ham's retreating defence and shaped one way, tricking Jenkinson, Collins and Reid, before pushing the ball on to his left foot and shooting low across goal. Far from satisfied, Chelsea pushed for more. Adrian tipped over Oscar's dipping free-kick and saved brilliantly to deny Matic following the resulting corner before Fabregas' shot went narrowly wide. Song shot wide 11 minutes from time with a rare Hammers foray forward. There was another as the match entered stoppage time, but Amalfitano could only clip his effort on to the post after a mazy run as Chelsea triumphed.